Oklahoma is worse than your average state for poker players. They are able to play live poker spread in one of the few casinos throughout the state. However, social gambling is off the table, and since there’s no clear laws regarding online poker, we have to assume that it’s more than likely illegal. That said, players willing to take the risk can still find sites to sign up to and play at online. We mention the best ones below, along with the rest of Oklahoma’s gambling laws. Oklahoma doesn’t have any laws or statutes that mention online poker specifically. So if you were to be charged, it would be under a different statute. How likely that is to happen, let alone how likely it would stick, is another thing altogether. But here are the two laws we feel the state could try to say you were breaking. This comes with a potential punishment of a felony, imprisonment of 5 years or less and a fine of $25,000 or less – or all 3. This is more likely than the first statute. However, considering that no one has been charged with a (internet) poker related crime, to the best of our knowledge, and that these aren’t specific to online poker, we’re not sure how likely it is that you would be charged with a crime for playing online. Home poker games are more clear cut. There is no law that makes social gambling legal, so based on the statute mentioned above we’re confident that if you were to host or participate in a social poker game you’d be breaking the law. In doing so you could be charged with a misdemeanor and/or felony, and be punished with a fine and possibly even jail time. To add insult to injury, here’s another statute that would make social games illegal. Do Casinos in Oklahoma Offer Poker? There are a couple of casinos in the state that spread poker games. Both are owned by the Choctaw Indians – one is the WinStar World and the other is the Choctaw Casino. The tribe has met with the state to discuss the possibility of running poker games in more casinos. However, the state has turned them down. What you’ll find in the majority of casinos instead, are slots and table games. We receive a lot of questions about playing poker in the state of Oklahoma. We thought it would be helpful to post those questions and our answers here. Will online poker be regulated in Oklahoma? We couldn’t find any information that would lead us to believe that Oklahoma will regulate online poker. If anything, given their disapproval for adding more poker games to their casinos, we’d lean towards the state regulating online poker to make it illegal. Is there an online poker room that accepts players from Oklahoma? Yes. Oklahoma residents will be able to sign up to Bovada, BetOnline, Sportsbetting Poker and any other poker site that accepts US customers. What other forms of regulated gambling is offered in Oklahoma? 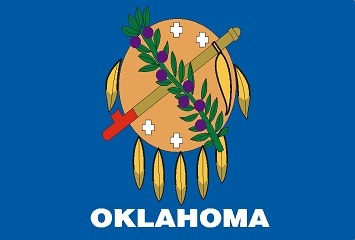 Oklahoma has over 50 tribal casinos, a state lottery, charitable bingo and para-mutual horse racing. Where can I read more about Oklahoma poker laws? Here are some Oklahoma gambling facts that we thought you’d enjoy. If you rent your home or apartment and are caught hosting a poker game, it could void your lease. Liability on official bond of receivers, etc. - Invalidity of leases. …Each day such property is so used, leased or rented for any such unlawful purpose shall constitute a separate offense, and the penalty herein prescribed shall be recovered for each and every day. All leases between landlords and tenants, under which any tenant shall use the premises for the purpose of violating any provisions of this act shall be wholly null and void, and the landlord may recover possession thereof, as in forcible entry and detainer. Train conductors can detain and arrest people caught playing poker on their train. Passengers can even be enlisted as deputies. If a police offer is caught gambling, they risk being charged with a felony, going to jail, paying fines and losing their job. Ben Lamb is a Tulsa native. He won the 2011 WSOP Player of the Year for a stellar performance. Of the 8 events that he played, he took 3rd in the Main Event, 2nd in the PLO event, 12th in the 10k 6-max event, 1st in the 10k PLO event and 8th in the 50k championship.